Status: Declared enemy of Chronos. 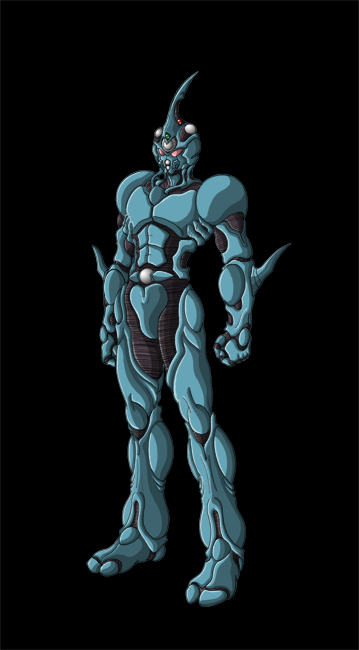 Description: Subject is the First Guyver unit to have been activated from the three units stolen from the former Japan branch of Chronos. Though at the time he possessed little to no combat skills prior to merging with the Guyver unit, he has none the less successfully avoided all attempts at capture and/or destruction by Chronos as he quickly learnt what it was to be a Guyver. Combined with the efforts of the third activated unit, Guyver 3, he was even able to destroy the Japanese Branch of Chronos and together they have continued their battle against Chronos. Consequently the Japanese Guyvers have since become valuable allies to the ACTF in the war against Chronos. Subject’s unit was removed was given a Praetorian unit. Psychological Profile: Subject is motivated by a need to protect those he cares about and to fight for what he believes is right. Consequently, the subject has been in continuous conflict with Chronos since accidentally becoming a Guyver and through that struggle has developed the indomitable will to fight no matter the perceived odds against him. This both makes the subject a valuable asset to the cause in the war against Chronos but also a potential liability as his loyalty to his friends and his moral code can be leveraged against him by the enemy, posing a potential weakness during this time of war. The Bio-Boost process results in the merger of the host and unit organism to form a new hybrid form that both enhances host biology and augments it. Essentially instantly transforming the host to reach their peak potential and combined with the infusion of energy from the boost dimension and special properties of the bio-boost organism results in a 100 fold increase in host physical strength and essentially grants the subject the strength of 100 men. The Bio-Boost process infuses the final Guyver form with a massive charge of energy from the Boost Dimension, which is maintained with a continuous trickle charge from the gravity control orb that continues to siphon energy from the Boost Dimension. The trickle charge, however, isn’t sufficient to power the subject at full power continuously and thus stamina varies according to how much energy is being expended at any point in time. Thus high powered abilities like the Mega Smashers can only be used once or twice before taking more than several minutes to recharge but as the charge is continuous it does allow the subject to regenerate from virtually any damage that doesn’t significantly damage or destroy the Control Medal. Though, if the subject is in safe enough condition to deactivate the unit then it is possible to fully recharge in moments by re-activating as that re-engages the main Bio-Boost process and thus fully recharges the unit in a instant but this leaves the host vulnerable for the time it takes between transformations. Analysis indicate that the Bio-Boost process greatly increases host metabolism, along with information processing enhancement due to CM interface. This grants the Subject a running speed of up to 250 MPH. While the gravitational control orb allows flight at speeds up to 300 MPH. Effective reflex speed is also enhanced to up to 40 times normal and allows subject to perceive most opponents as if they were moving in slow motion. Combined with Unit’s enhanced hyper sensory perception allows subject to react incredibly fast and accurately, while not capable of catching a bullet subject is capable of blocking and redirecting shots fired at unit and is capable of intercepting and destroying bullets in mid-air with the head beam, as well as use the forewarning of enemy fire detected with unit’s hyper sensors to dodge most attacks. Subject’s unit greatly enhances senses far beyond the normal limits and range for a human, but the Unit’s CM link to the host brain also lets it help process the sensory information that come from the Unit’s 3D sensory orb system, the roving metallic orbs located on either side of the subject’s head, granting subject a near omnipotent awareness of his immediate environment. Also, since the hyper sensors can also scan through obstacles, within its active sensory range, it is nearly impossible to surprise Subject in battle. The effective real time range of the Hyper Sensors have been estimated to be approximately 100 meters (~328 Feet) for active perception and up to ten times further for passive perception. While the hyper sensors lets the host essentially perform a extensive scan of a target’s biology to the point that the host can distinguish the difference between a human brain and a zoanoid’s brain, as well as detect when a opponent is about to fire a projectile or energy beam weapon and with enough accuracy to usually dodge the attack or otherwise counter it with Unit’s own weapon systems. Subject’s bio-armor is extremely tough and durable to the point that it usually requires Hyper Zoanoid level attacks to damage it and can usually regenerate any damage given enough time as long as the Control Medal isn’t damaged or destroyed. This has allowed subject to survive sonic and kinetic blasts capable of shattering steel, intense heat in excess of 5000 degrees and even only sustain negligible damage from the Guyver’s own head beam infrared laser that is easily intense enough to slice through steel I-Beams in a single quick discharge. Though, vibrational type weapons, Gaster missiles, and similar high range weapons can damage the unit significantly and of course anything more powerful. The CM itself is vulnerable to direct electrical shocks, because of the direct host brain link, but is otherwise only vulnerable to certain sonic attacks that can impair the function of the CM and eventually cause the host to lose consciousness and the unit to self deactivate. While the unit can be temporarily protected during the activation process as the Bio-Boost process generates a worm hole event horizon around the subject as the unit transitions from the boost dimension to normal space but this only lasts a instant and otherwise can’t be used tactically. Leaving the subject only the ability to use its pressure cannon defensively by holding onto it and using it to deflect attacks around the subject but this can allow the subject to survive attacks that would normally be capable of instantly destroying the subject. The Head Beam Orb is a Infrared Laser emitter, which channels the internal thermal energy of the unit as a directed energy beam. The essential function serves as a heat vent for the unit but the Guyver effect and power level renders this a effective weapon that can be effective on anything less durable than a durability enhanced hyper zoanoid, along with enough speed and accuracy to even intercept a bullet in midair. However, since infrared energy is absorbed by the atmosphere the effective range is limited to only up to 1.6 km (1 Mile) under optimal conditions but for full effect the target should be within a couple hundred feet of the subject. –Pressure Cannon: A standard weapon of the Guyver is the ability to focus their unit’s gravitational power, from the Unit’s gravity control orb, through their hands, which contain gravity focusing organs, to produce a gravity weapon called the Pressure Cannon. This weapon is essentially creates a virtual event horizon, similar to the effect of a black hole but without the equivalent mass, which evaporates upon impact but the spatial displacement produces devastating localized effect equivalent to the damage that a artillery shell could produce. Thus this is a weapon that’s capable of blowing a hole clear through a standard zoanoid and with up to three fired in quick succession a Guyver is also capable of taking out most hyper zoanoids with this weapon, provided they don’t have a ability that negates the effects of the Pressure Cannon or otherwise disperses it before impact, such as with a barrier shield or other protective field. Even fired single handedly with only about half its power, this weapon is still capable of blowing the head off a standard zoanoid and can cause grenade like explosive effects when fired upon solid objects like walls, the ground, etc. which can also be used tactically to distract or unbalance a opponent and can be fired fairly rapidly with at least three discharges in quick succession that can hit the target at nearly the same time for a accumulative effect that can help against more durable targets. –Kinetic/Gravitational Momentum Organs: The unit has organs located on both forearms, and lower legs which allow the transfer of gravitational energy form the gravity control orb into these organs to allow the host to punch or kick harder than he normally would produce. This allows him to instantly boost his momentum by a factor of 10 as his mass is much lighter than it would be his proportion to this strength. The process is not automatic and must channel that energy himself. The Guyver’s ultimate weapon is the Mega Smashers, which are incredibly powerful particle beam based weapon emitters contained within each chest plate. While the energy output of this weapon can vary, each chest smasher cell is capable of unleashing enough destructive power to destroy a skyscraper with the energy equivalent of the power unleashed by an up to 100 kiloton explosion of TNT per smasher cell and a beam duration of a split second on up to a full second. Though, the energy reserves of the Unit only allow this weapon to be fired once or twice before requiring more than several minutes to recharge and restore the expended energy but with up to 200 kilotons of TNT worth of destructive energy there is very few things that can withstand this attack. The only weakness of this ability is the up to few seconds it takes to charge and fire the attack, along with opening of the chest plate and exposing the more vulnerable smasher cell, renders the subject vulnerable to attack until the weapon can be fired. The unit forearms contains extendible vibrational swords. The subject’s configuration of these weapons is a pair of elbow swords that can extend up to a meter in length when extended. Basically the swords are a specialized form of the bio-armor capable of vibrating at high frequency, generating a sonic shockwave around the blade that effectively lets the weapon slice through almost any material as easily as moving through air, except for shielded or other vibrational weapons of equal power range but can be damaged like any other part of the armor when not active. The unit’s sound emitting orbs that are normally used for speaking can also be used to create a weapons level sonic attack capable of causing a variety of effects from exploding someone’s head to essentially vaporizing a zoanoid(s) within relatively close proximity. Only hyper zoanoid level beings have shown they can withstand this attack but at point blank range they can still cause Hyper, like Darzerb, to rupture their blood vessels and cause heavy facial bleeding, blinding effects. These weapons can also be used to break through walls, breaking it up into dust, and cause structures to crumble as they are vibrated apart. The unit’s Control Medal is the single most important component of a Guyver unit, regulating and controlling the Guyver unit and all its functions and allowing the host, through a direct link to the host brain, to control the unit organism and power of the Guyver. While appearing as a metallic orb, the Control Medal has a crystalline molecular structure, with inorganic and organic elements, that is essentially a extremely advance quantum computer that both serves as a host brain interface and a computer system with limited A.I. capabilities. This makes the Guyver possible but also poses its one weakness as anything that can harm or impair the Control Medal can impair or even destroy the Guyver. The Control Medal also contains all the data of the host, DNA, memories and is what allows the host and unit to be fully restored no matter the level of damage as long as the CM remains intact but if a Unit remover is used on the Unit then the CM will be erased and that data would be lost. While the CM utilizes a direct host brain interface while the Unit is active, the host maintains contact with the CM through special organisms on the host back that maintain the link to the host nervous system and thus allows the host to call the unit at will. GIGANTIC UPGRADE: The upgraded created when the subject was linked to the Relic’s control medals when it was destroyed which caused a mutation caused by the Guyver effect, to create this incredibly powerful upgrade. The upgrade responds to the subject’s will and at times can be willed to other Guyvers either by choice or by force of will. The powerful upgrade dramatically increases the subject’s base powers and increase his strength by several fold, it also adds additional abilities not shown in the subject’s unit. Such as able to project a powerful shield system capable of withstanding all but the most powerful attacks, addition of back thrusters for quick acceleration and attacks. The upgrade possesses power amps that greatly enhances the subject’s power channeling abilities which allow for additional powerful attacks. Subject lost the use of the Gigantic Upgrade when he had his unit removed by Dreadnought in exchange for a Mk. II Warrior Type 2 unit, now code named AEGIS.